If you are looking for a pancake-style air compressor, you might want to stick around for this one. With so many different tank styles available, each with their own set of pros and cons it can be a bit confusing to decide which one is most suitable for the kind of work you do. If you are in “that place”, feel free to check out my guide on the different air tank styles available. Pancake compressors are extremely useful when you need a high amount of pressure delivered in short bursts. Obviously they are not suitable for extensive work because they have small tanks. On the other hand, they are light and small which makes them extremely portable. This time around, I decided to review a compressor manufactured by DeWalt, one of the leading compressor brands. In case you are not familiar with the name, you should know it’s a subsidiary of Black & Decker, and you’ve surely heard of them! 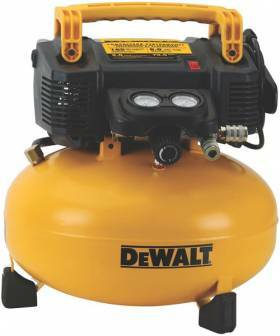 The pancake compressor I will be reviewing today is the DEWALT DWFP55126 6-Gallon 165 PSI which is one of their most popular models. Below, I’ve outlined why it’s the compressor of choice for so many people. The compressor is built around a high-efficiency motor capable of smooth starts when the unit is plugged into an extension cord or even in cold weather. The maximum pressure it is rated for is 165 PSI, which I think is pretty fantastic. The tank capacity is 6 gallons, and the air delivery rate is 2.6 CFM at 90 PSI of discharge pressure. It is also equipped with a high flow regulator in order to provide maximum performance. It comes with 2 universal couplers which means it can run two power tools simultaneously. The pump design is oil-fee for easier maintenance, and it has a ball drain valve which allows you to drain the tank fully in order to get rid of all the moisture that builds up inside. Given the high pressure rate, this unit is surprisingly quiet with a noise level of 75dB. It is very light, weighing just 30lbs which makes it easy to carry it with you to any location. Other features include rubber legs which improve stability and keep your floors scratch-free. Most power tools operate at 90 to 120 PSI which means this one is able to power just about anything provided you use it for short bursts only. The power specs mentioned above is enough for tire inflation, air cleaning and small repairs. These small high-pressure pancake units tend to be really loud, but somehow this one isn’t making conversation while you work a possibility (always a plus)! You will often find oil-free pumps on these small pancake compressors, and this one is no exception. Oil-free pumps are convenient because they are low-maintenance, but they also excel in low temperatures and on uneven surfaces. You are spared the hassle of having to change the oil every so often. Oil-free pumps have permanently lubricated bearings, so that’s one more thing not to worry about! If you are looking for an air compressor that is first and foremost, small, lightweight and portable, this pancake compressor is (in my opinion) a great choice. I’m impressed with its max pressure of 165 PSI, and a steady rate of 2.6 CFM at 90 PSI. The 6-gallon tank is larger than those found on some of the competing models, so it strikes the perfect balance between air capacity and portability. Also, one of the biggest benefits of this small compressor is the low-maintenance design thanks to the oil-free pump. If you think this pancake air compressor sounds like the unit you’ve been looking for, take a look at Amazon which is my favorite online retailer for lots of reasons (but mostly because of the discounts they often have).